Only three turned up to test out the new snow board (see right), and Makoto celebrated the occasion by showing off his brand-new Kislev force. 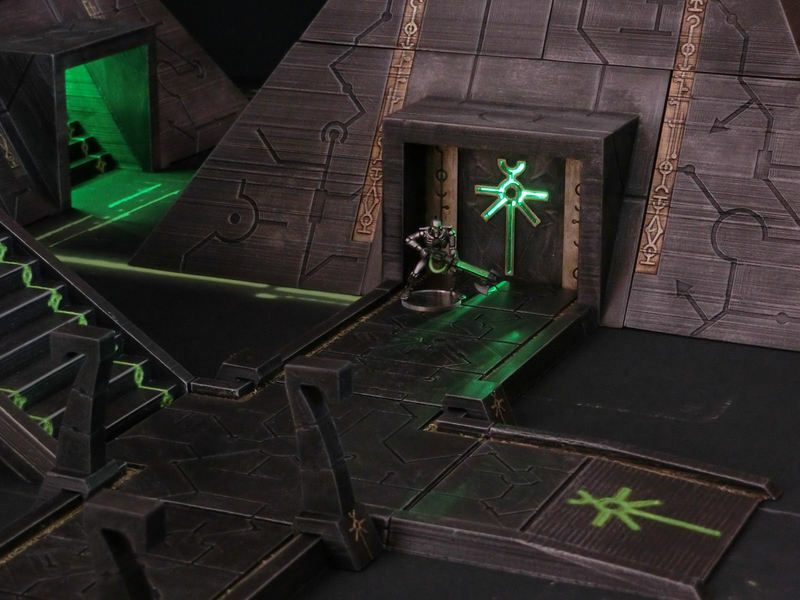 We played three games; number one was a small 500 pt training battle to get the feel for the newcomer force, second game was a Skirmish scenario "Silence the Watchtower", and lastly was a three-way battle played without Wizards. 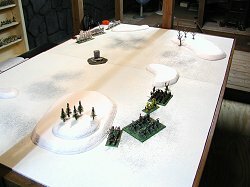 Hurriedly forming ranks in the early morning, the Kislevites stared across the glistening white plains, freshly blanketed by the first snow of the season. The breathtaking effect was somewhat spoiled by the raucous cries of a goblin warband who had been sighted, or rather heard, from far across the plains earlier that morning. As the goblins drew closer a pack of wolfriders became clearly visible, loping quickly across the snow. Although outnumbered two to one by the wolfriders, the Winged Lancers showed no consternation, and laughed to each other as they jabbed their lances at imaginary foes. The wolves would die, and the goblins clinging to their flee-ridden fur would not tip the odds. The Boyar threw out his hand, and the five horse archers trotted off to the left flank. 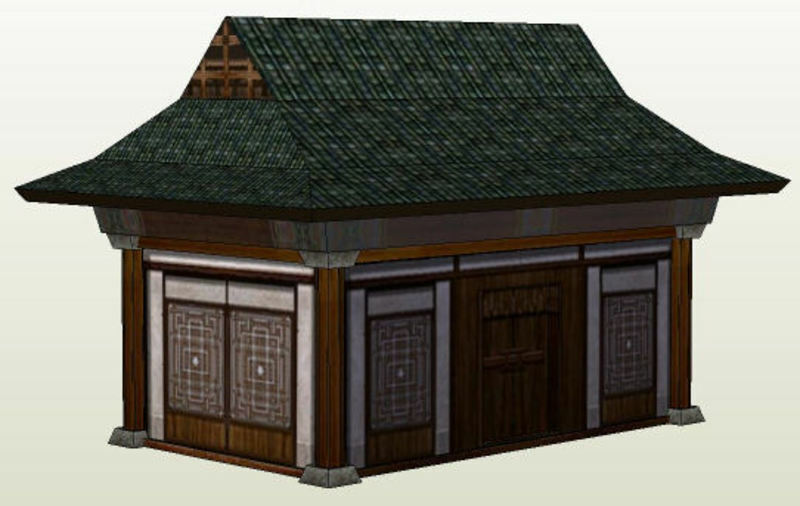 They had been recruited only last night at the village's drinking hall, and seemed not to have suffered from the huge amount of vokka they'd consumed. The eleven Kossars tucked their great axes into their belts, and started stringing their bows. They had sighted two stinking trolls shambling along behind the goblin horde, and the Boyar could not blame them for wanting to stack the odds in their favour. They slowly stepped backward over the frosty ground, seeking the better view afforded by the high mounds left by last night's snow storm. At last the goblin rabble advanced within bow range, and the shafts shot skyward. A small cheer rang out as crew toppled from the goblin chariot, but their Boyar quietly noted that their marksmanship would require considerable training back at camp later that day. The goblins seemed to be grouping their forces, and advancing as one solid wall of spears and drooling jaws. The horse archers bravely advanced to the center of the killing ground, obviously hoping to draw the goblin flank aside. The goblin boss grunted to his trolls, and foolishly obliged. Hah, the Lancers saw their chance and spurred their mounts forwards, snow flying from their hooves. To their chagrin, the cowardly wolves turned tail at the terrifying whistling from the Lancers' winged back banners, and fled before even a drop of their blood could be spilled. NOTES: Battle was not met until the sixth and final turn of this game, as Makoto was unsure of his troop's strengths and weaknesses. The archers did indeed perform fairly poorly, but mostly due to a lack of targets. After all, with a charge of 18" for wolves, the archers could only be sure of one good volley. His Lancers waited patiently for the charge, and eventually panicked the wolfriders with their infamous 'whistling feathers'. Pity we didn't get to see them fight though! 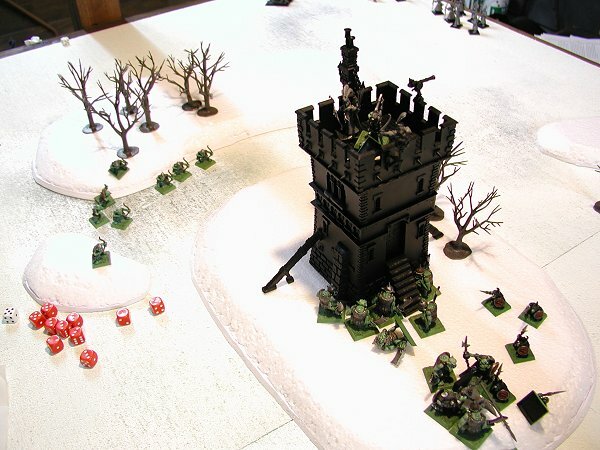 A lone watchtower manned by a handful of high elves was attacked by 20 goblins and 15 orcs. The game lasted 6 turns, with the winner being the player controlling the tower top on the final turn. Although horribly outnumbered by the greenskins, the high elves fought bravely - aided by their strike first rule. The orc champion gained access to the tower, but the rest of his force were blocked by the superelven efforts of a lone spearmen at the foot of the tower. All the while, the elves dispatched foe after foe - bringing them slowly closer to the 9-casualty body count, which would force rout tests in the orc attackers. But eventually it came down to the final 6th turn, when the three elf defenders in the tower top managed to struggle to their feet and throw back the orc champion. The beacon blazed brightly across the snowy valley, and the game was won! Sorry, no photos of this fast game. Nobody had magic users, and the forces were fairly well balanced. Each had a good mix of shock troops and archers, although the high elves gained the edge with their bolt-thrower. No clear winner in this game, even though the dryads took the objective in the table center. The rest of the wood elves had been slain, whereas fully half the high elf force was still in play. The Kislev Lancer cavalry has gained the charge against an equal number of elven SilverHelms, and flattened them convincingly. But the dryads had scared off the other kislevite archers and horse archers. 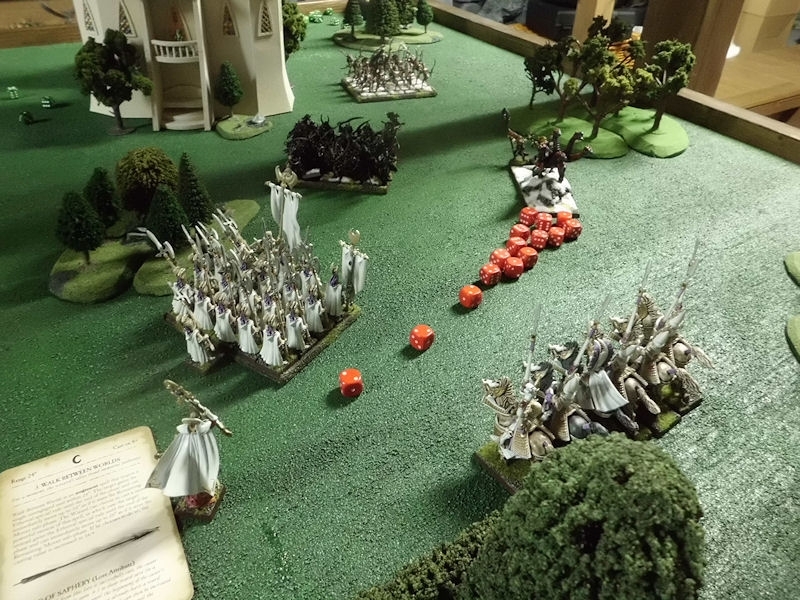 Each army had a good and bad unit, although the High Elves probably would have won had the bloodsoaked Winged Lancers not rolled so high for a pursuit roll and crashed into the flank of their spearmen unit. Great, fast game!